KPJ Penang Specialist Hospital, is a multi-disciplinary private specialist hospital located in Bandar Perda, Bukit Mertajam, Penang. It is a fast expanding network under KPJ Healthcare Berhad, a healthcare group listed on Bursa Malaysia with a network of 22 hospitals in Malaysia & 2 in Indonesia We are currently operating with 168 beds at the maximum capacity of 236 beds. In line with our mission to deliver quality healthcare services to our customers, we are looking for dynamic, progressive, and dedicated team of healthcare professionals with the passion to drive and lead the organization to be the preferred healthcare provider in northern region. If you have a high passion to perform, proactive and have the desire to succeed, you are invited to join us and be part of our full-time team in various disciplines and services. 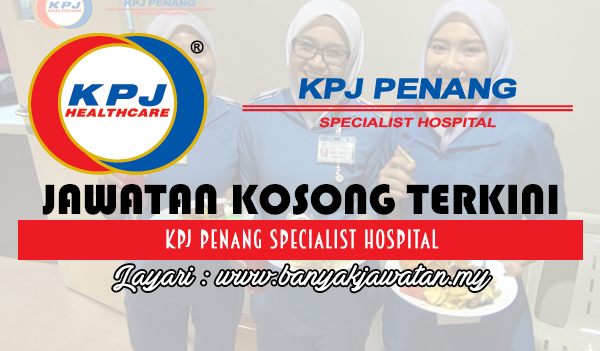 0 Response to "Jawatan Kosong di KPJ Penang Specialist Hospital - 24 March 2018"